It’s a good time to be a fan of the Jam. There was the recent six-disc live boxed set titled Fire and Skill that came rolling out in late 2015 and this cradle to grave (and beyond) documentary about three lads who didn’t change the world but sure gave their countrymen (and women) something to shout about. That the band never really made a splash on American shores is one of life’s great mysteries considering that their predecessors, the Who, and their Britpop offspring gobbled up the attention that probably should have been theirs. To hear Jam man Paul Weller tell it, he wouldn’t have had it any other way. So be it. The cradle part of this story goes back to the group’s formation in the early '70s in Woking; these were kids, including early members Steve Brookes and Dave Waller, who were slight anomalies, more obsessed with the Who than the stuff their peers were listening to the trio was of the punk era but not entirely punk. There were lyrics about class distinctions in the age of Thatcher, the usual paeans to girls and country, and a nod or two to the angst that drives most rock ‘n’ roll bands. Toss in a Kinks cover, some sensible clothes and some maximum R&B and that was the Jam. Well, partially. There was an energy to the music that none of their peers really captured. The Clash is said to have had the attitude but the Clash didn’t have the same knack for melody or the same appreciation of soul; Johnny Rotten and his lot had the anger but not the staying power and no one from that era was half the songwriter that Paul Weller is. 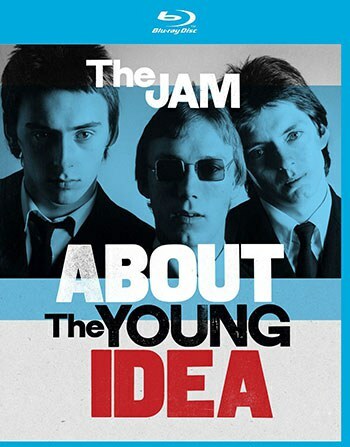 (The only band from the era that came close to touching the Jam was Doctor Feelgood and the classic version of that band didn’t last nearly long enough.) A true one-off in terms of his ability to distill the questions of the age in a power-packed single is as striking today as ever. That he found two men of equal dynamism to help tell his story in the forms of drummer Rick Buckler and Bruce Foxton is not as much a testament to fate as to his intelligence. We are treated to the album-by-album approach here, though never lingering too long on any one record and we get to hear the story of the song “The Eton Rifles”, an absolute career high from Weller. Fans and critics debate the merits of this release and that and viewers will no doubt voice their dissent with certain opinions as appropriate. The title of the film comes from a Jam-centered exhibition at Somerset House in London as well as a recent compilation of the same name but it’s also what carried the band along. This was the music of youth and it remains so even if its creators and original fans no longer do. When the group came to an end in 1982, Weller moved on with his soul-centered Style Council while Foxton and Buckler had a slightly harder time of moving on. Weller’s time as a Style Council man was relatively short lived and he’s continued as a solo artist, issuing a number of top-quality albums over the past few decades. Foxton joined up with Stiff Little Fingers for a time, pursued a solo career, and toured with the Casbah Club featuring Simon Townshend, Mark Brzezicki and Bruce Watson and is of late a member of From the Jam, which also briefly featured Buckler who’d had his own Jam tribute act, the Gift. The Blu-ray includes additional interviews and four live tracks, including two from a spell in New York City. A DVD in that package, titled When You’re Young, finds the band live in concert at Rockpalast in 1980 with a jaw-dropping 22-song set. A deluxe edition arrives with an audio version of that show and a 40 page booklet with plenty of eye candy.